I was pretty chuffed to be selected as one of the Cake Patterns Red Velvet “Muses” to test sew Steph’s latest pattern offering. I was provided with an early version of the pattern in return for honest feedback and some photos of the finished dress. I loved this pattern so much I ended up making two very different versions of Red Velvet to see both options and also to test my now perfected forward sloping shoulder adjustment for knit kimono sleeves. 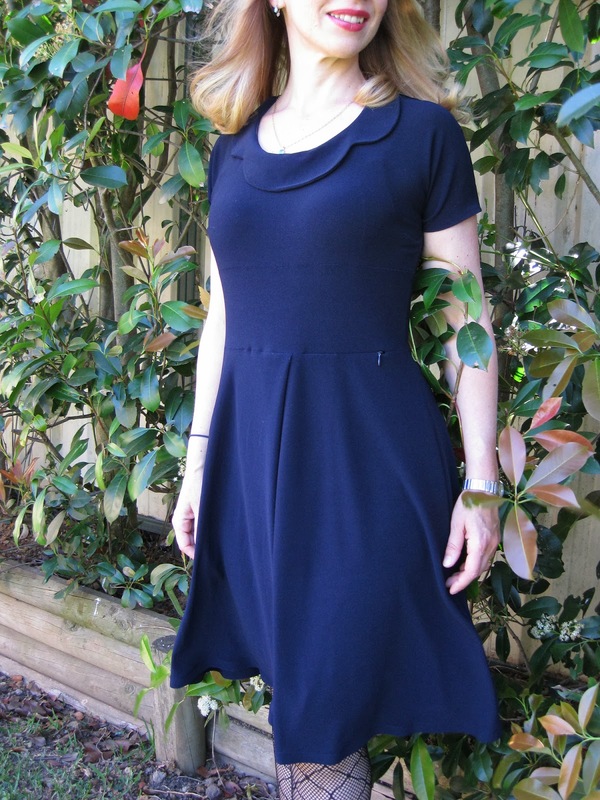 My first dress is in a super-stretchy super-drapey jersey crepe from Spotlight in a classic navy. 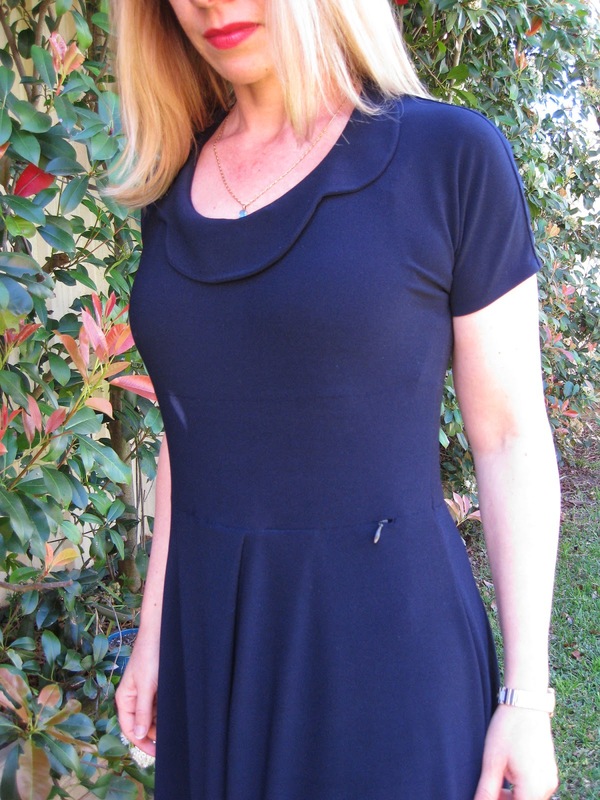 I have really needed a simple “LBD” addition to my wardrobe and this pattern fitted the bill perfectly. This pattern is in the category of “deceptively simple”. It is an easy make but it includes subtle details that take it to another level and produces a very “RTW” appearing finished product. I absolutely adore the scalloped collar, it is completely my style so I chose that version for my first make. I used the scissor pleat skirt option and added the very clever hidden pocket basically to just test that aspect of the pattern. My aim was to produce an elegant and ladylike dress that would work well for a variety of dressy occassions. To read some more fitting notes and see a couple of pictures that I haven’t shown here, make sure that you head on over to see this dress on the Sewing Cake Red Velvet Muse page! The proportional sizing guide that Stephanie has developed has been really refined and improved since I made the Tiramisu dress. I previously had to fiddle quite a bit to adjust for my A-cup bust but this dress fitted perfectly without any adjustments straight up. The small busted among us can rejoice! I just chose my bodice size based on my high bust measurement (35″) and then my cup size based on my full bust measurement. For me these measurements are the same so I naturally chose the A cup sizing and it is a perfect fit. 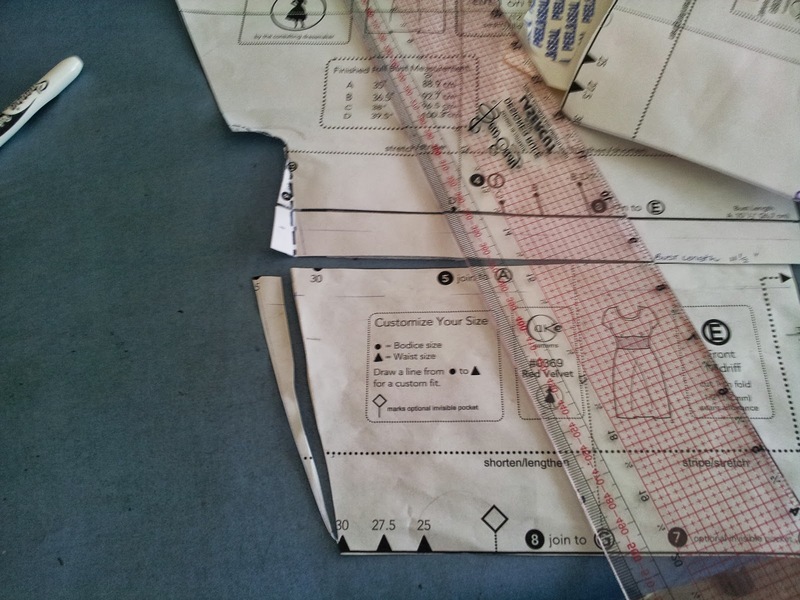 In the cutting instructions you are asked to measure your length from shoulder to underbust and add length if needed. For me that meant I needed to add about 1.5″ in length. 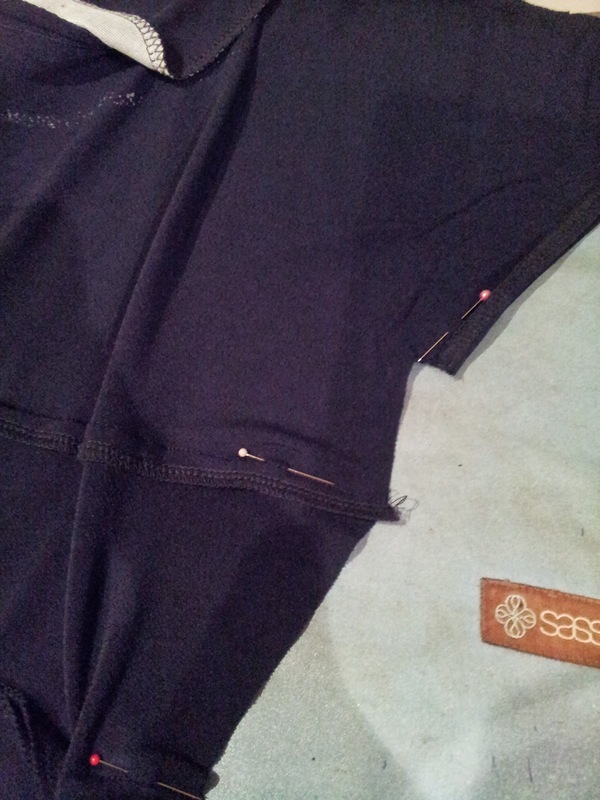 As my fabric was a very stretchy 4-way stretch I added 1″ and it was perfect. The scissor pleat is interesting and I’ve never seen it before, but easy to do and gives a lovely shape to the skirt. I have a bit of a baby belly and this dress just skims over everything! 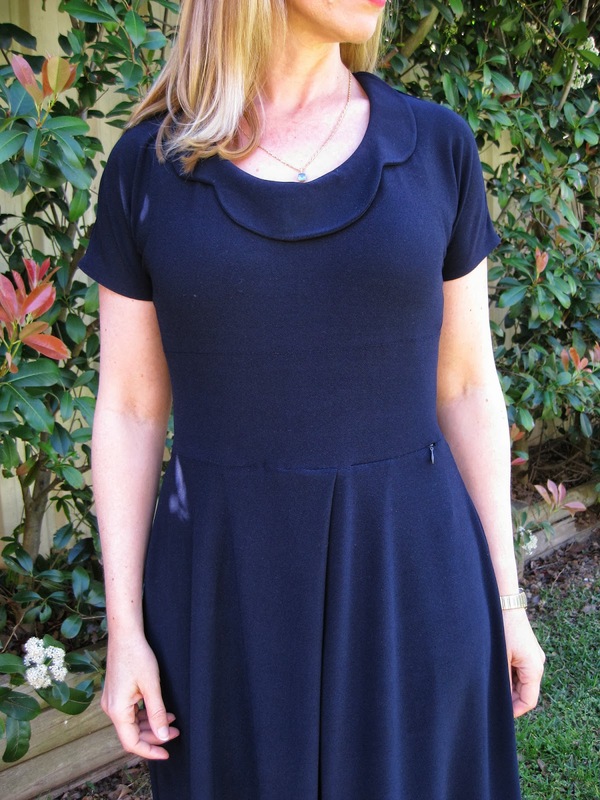 After I had sewn the dress up I noticed excess fabric in the shoulders – I was expecting this as I usually need to do a forward small sloping shoulder adjustment. For this dress I did a “cheaters” fit and just re-sewed the shoulder seams taking off a wedge of fabric to remove the excess fabric and it works fine. For my second dress I did a “proper” adjustment which I will detail when I post about that dress. This grainy photo shows my “cheaters” small sloping shoulder adjustment. My only other adjustment was when sewing up the side seams I found I needed to slightly adjust the side seam for the front bodice – I just straighened it out where the bodice joined the waistband. I then transferred that change onto my paper pattern so I could sew up the side seam without fiddling for my future makes. 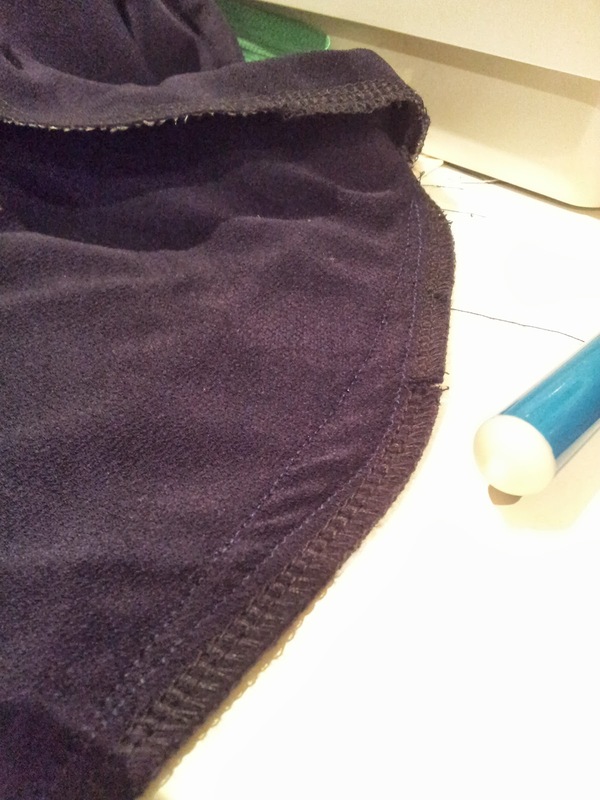 As you can see in the photo above I just took a 3/8″ (1cm) triangle shape wedge off the bodice and waistband which straightens out the pointy sideseam a bit which worked better for me. I wanted this dress to have a looser fit so I did not take it in too much when I sewed up the side seams. Leaving this part of the construction until almost last makes it very easy to tweak the fit to work with the fabric and look you are after. I followed Steph’s recommendations to use a strip of interfacing on the hem to stabilise it and I really like the structure that this gives to the hem. I have a little bit of rippling at the front waistband which happened when I sewed that seam, I think I stretched it out a bit when sewing through all the layers around the pocket as it does get bulky in that area but it is more visible in the photos than in real life as the fabric is a dark navy and tends to absorb all inperfections. So there you have it, my first Red Velvet in elegant navy. My second version is a very different look and I’ll be posting about that in a couple of days.